The following review is 100% real and 100% authentic. I was not compensated in any way for this opinion. Last Father’s Day JenB gave me one of the best gifts I’ve ever gotten on that holiday – a brand new, self-propelled lawn mower. If you’ve ever mowed a yard in the south in the summer you know how difficult it can be in the 90+ degree heat and high humidity. I’m not getting any younger and continuing to mow my yard without some assistance was ultimately going to be the death of me. Jen picked up the mower on sale at Sears – I’m pretty sure they were having a Father’s Day sale on things that dads want. You know, power tools, lawn mowers, tv’s, etc. She brought it home partially assembled and it didn’t take me any time at all to complete the assembly. Having gone from a mower that I had to push entirely on my own, I was very appreciative to have the assistance of self-propelled. The self-propelled drive works adequately, even in the ‘crunchy’ grass we have here in Florida. I have a relatively flat lot, so hills aren’t very much of a concern but my yard does have some slope. I like that the mower gives me the ability to control the speed of the drive using the red drive handle. If you want to go slower, simply let off the drive grip. If you want to go faster, just give it a squeeze. You can go exactly the speed you want to go. I also like the “Dust Blocker” bag as it seems to really live up to its name. While it doesn’t completely eliminate dust from the bag area it does seem to greatly reduce it, which makes for an overall more pleasant lawn mowing experience. Unfortunately, my list of what I didn’t like about the mower is a bit longer than what I did like. Let’s start with starting the mower. My previous mower (a Honda powered mower) started on the first pull every single time. It would start on the first pull even after an extended period of not using it. While the Briggs & Stratton powered Craftsman isn’t difficult to start, it has never started on the first pull since the day I got it. Experience tells me it’s never going to be easier to start than when it was new, so I expect the starting to continually degrade as I use it. The design of the bagging mechanism is really quite poor and not the best quality. While it’s not difficult to remove the bag from the mower, it is a bit awkward and there’s only about one angle that you can effectively remove the bag. This makes emptying in tight spots a challenge so give yourself plenty of room. The biggest complaint I have about the mower is that the bag chute from the mower becomes very easily clogged to the point that it bottle-necks at the chute and often won’t fill the bag more than about 1/4 full before it require manually clearing. I’ve mowed my yard in every season and in almost every condition, although I try to avoid mowing when the grass is wet. Even when the grass is perfectly dry and not prone to clumping I still regularly experience the clogging of the chute. The above chute clogging problem also makes the mower difficult to use on ‘mulching’ mode, where you remove the bag and simply have the mower mulch the mowed grass clippings. The chute to the bag is large enough, even when the bag is removed, to accumulate clippings and interfere with the blade even in mulching mode. I would mow through average height grass and would regularly hear the blade ‘clunking’ on the grass as it accumulated in the closed bag chute. Overall, this made for a very poor design. 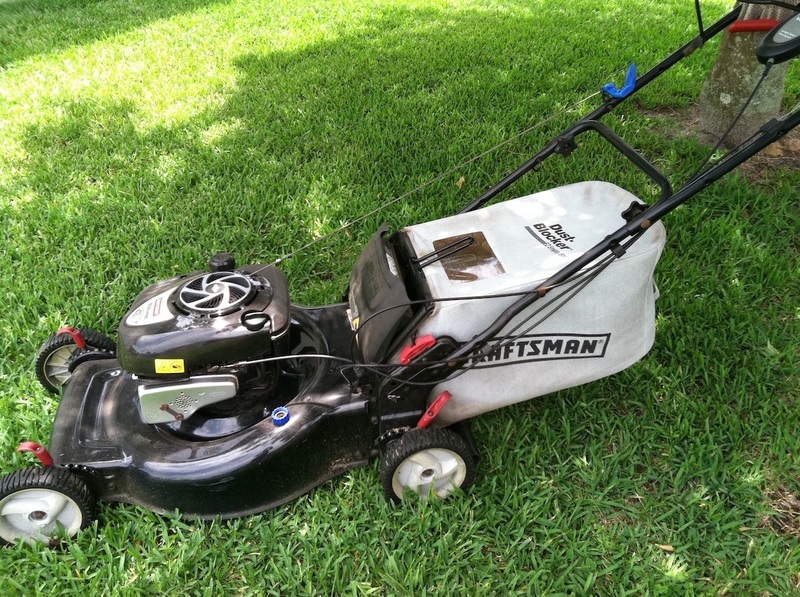 This mower has many of the features walk-behinds have today. Really liked the variable-speed option. Self-propel works ok but not great. Terrible, horrible, very bad bagging. Clumps easily, never fills up. I stopped using the mower with the bag installed. I purchased on sale for around $200, and was one of the lesser-expensive self-propelled walk-behinds. I think you can do better at this price point, though.